Picture collage from West Ham Women’s Forum open discussion meeting with Shadow Chief Secretary to the Treasury, Seema Malthora MP. How does Labour gain economic credibility with the British public and by when? What is Corbynomics and could it work? How radical is it in reality, and does it stack up as a practical plan for creating economic growth? How will we encourage economic empowerment of women entrepreneurship? How are we as a party developing our policies and policy positions for a very important Party Conference in 2018? What is the Labour Party’s vision of a 21st Century Welfare State? What is the Labour Party’s vision of UK Technology and digital infrastructure? What is Labour’s response to local government budget cuts? This event was organised by our Women's Officer, Seyi Akiwowo and was open to men and women. Seema got held up with London Underground problems, so our local MP, Lyn Brown stepped in for a Q&A until Seema arrived. When she did arrive she pointed out that the awful delayed 2 hour journey she had experienced showed the need to get a London Labour Mayor in charge of transport! Seema spoke about Labour values and directions. Labour in a future government would think differently and be long term. There is an alternative economic policy. The Tory cuts are the wrong type of cuts and what we want is to see the economy growing and the government getting more taxes in. Women had paid the biggest price from this governments cuts. She also supported small businesses as the backbone of the economy and had herself grown up in a flat above a small family business. Seema is a "safe pair of hands" as Shadow Chief Secretary - sensible, confident, quiet but firm. Afterwards we went off to Jerrys, a local cafe for some drinks and snacks. What to do if you are a trade unionist with a pension manager that attacks you? "Ahh.... Fidelity, the lure of right-wing British politics is just too strong for you isn't it? I've blogged previously about the latest Fidelity link to the Tories - their involvement with the Leaders Group. According to the Conservative Party's own website this is the "premier supporter group" for the Tories, with an annual membership of £50,000. 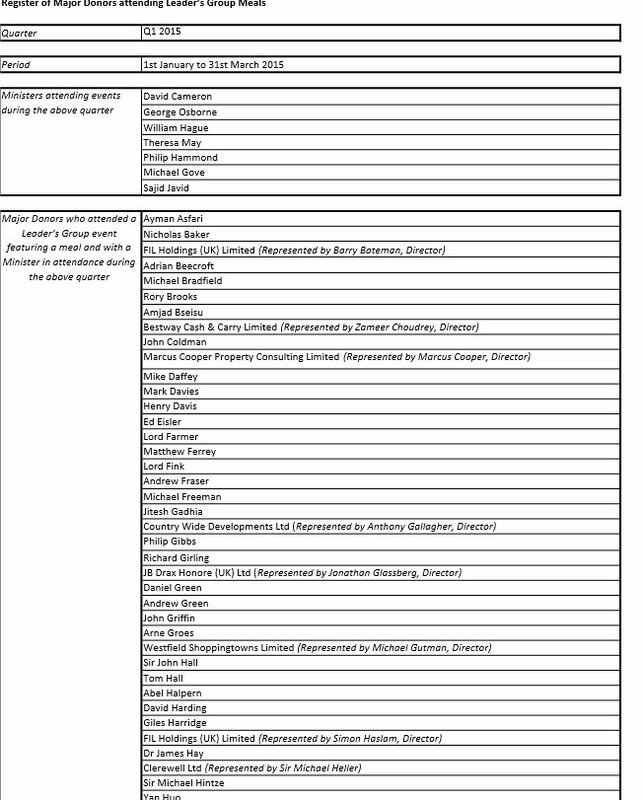 As if you were in any doubt about which party Fidelity were rooting for in the General Election, the Q1 2015 disclosure of which "major donors" attended Leaders Group meals in the first quarter shows that both Barry Bateman and Simon Haslam represented Fidelity (FIL Holdings in the list). It isn't clear if the were both at one meeting, or if more than one was attended. As well as being a board member of FIL, Simon Haslam is of course also chair of Colt, where Fidelity is the major investor. Of course the Conservative Party has embarked on a major assault on trade unions since the election, something that was trailed in their manifesto. If you are a trade unionist who is a pension fund trustee or otherwise has some involvement in this area you might want to choose asset managers who don't fund attacks on you". Well done to Southwark UNISON for sponsoring this event "On Wednesday, 2nd March, Dulwich Hamlet FC are playing a fundraising match against Middlesex County Leaguers FC Assyria, with all money raised being split between the British Red Cross Syria Appeal and the Southwark Refugee Communities Forum. The idea for the game came after Southwark Councillor Jasmine Ali approached the Dulwich Hamlet Supporters’ Trust to see if the club would get involved in another fundraising initiative (many Dulwich Hamlet fans have also been helping bring vital supplies to refugees across the channel, via the enterprising Dulwich2Dunkirk campaign). Dulwich Hamlet play Stonewall FC in England's biggest anti-homophobia exhibition match, Weds 11th February, 2015 The club explains that by playing FC Assyria (who compete one division above Stonewall FC, who Hamlet played in an ‘Anti-Homophobia’ event a year ago), they not only help raise much needed money & resources, but they also get the chance to work with one of the many unsung lower level teams further down the pyramid. FC Assyria was set up in the late 1960’s to represent the Assyrian Society of United Kingdom in Ealing, West London. Over the past thirty years or so, the team have successfully competed in the local leagues, challenging for both league and cup honours. These traditions are still alive today with the team playing at Step Seven, four rungs below The Hamlet Who are the Assyrians? The Assyrians of today are the indigenous Aramaic-speaking descendants of the ancient Assyrian people, one of the earliest civilizations emerging in the Middle East, and have a history spanning over 6750 years. The Assyrians are Christian, with their own unique language, culture and heritage living mainly in Iraq, Syria, Iran and Turkey. Unfortunately due to War and ISIS attacks, many Assyrians have had to flee their homelands and become refugees. Reaching out The club explains that forthcoming game will give them the opportunity to reach out to both the local refugee community in Southwark, and across London, as well as using the Club as a medium to “counter much of the discriminatory nonsense that is scaremongeringly covered by the media, in general. As well as making a practical difference to those who have not managed to find places of safety yet.” All of the money raised at the match will be split between two very important charities, one local & one national. The Southwark Refugee Communities Forum are one of our match partners, with the other half being donated to the much larger national British Red Cross Syria Appeal. This was in the "Newham Recorder" letters page this week. 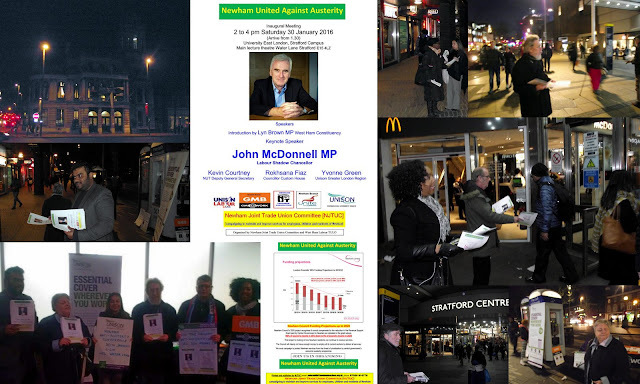 I am writing to invite Newham Residents to the inaugural meeting of a new campaigning organisation for our Borough, “Newham United Against ‎Austerity”. 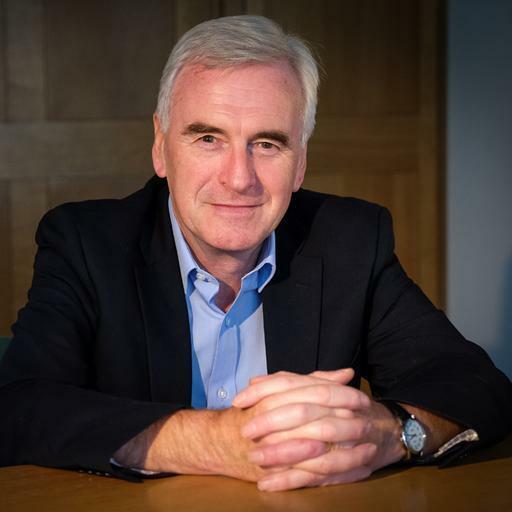 We have a special guest speaker for our launch, John McDonnell MP, the Labour Shadow Chancellor. The event is free and open to all Newham residents and workers. It is the start of a joint trade union and community based campaign against the Government's attempt to starve Newham’s public services of funds and impose Austerity upon us. 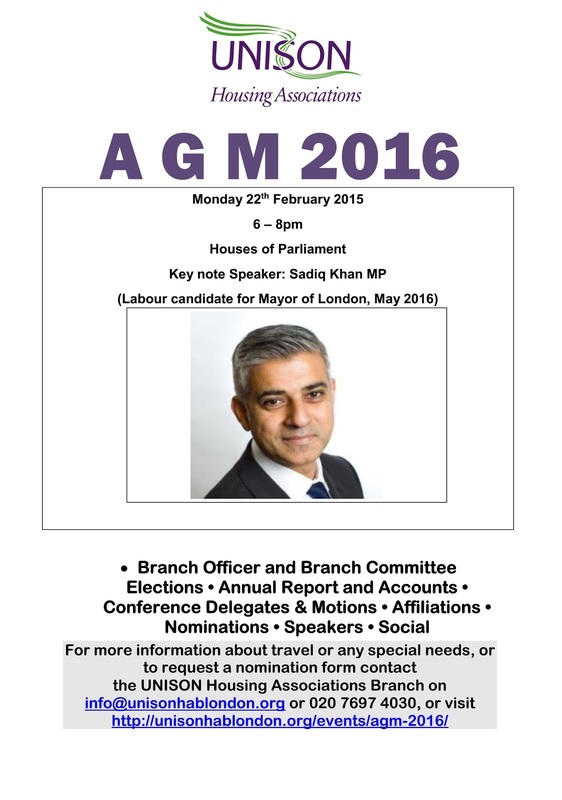 The meeting will take place 2-4pm, Saturday 30 January 2016, University East London, Stratford Campus, Main lecture theatre Water Lane Stratford E15 4LZ. Our MP Lyn Brown will be there and the other speakers will be Kevin Courtney, the Deputy General Secretary of the National Union of Teachers, Custom House Councillor, Rokhsana Fiaz and Yvonne Green, the Greater London Convenor for the public service union Unison. There are no tickets so please turn up promptly. Amusing advert but so important that small employers understand that they have to sort out pensions for their staff by law. Hat tip https://www.gov.uk/government/news/workie-says-dont-ignore-the-workplace-pension While automatic enrolment into workplace pensions has been rolling out across the UK since 2012, it is only now that 1.8 million small and micro employers are being required to take action to help their staff to save for later life. Find out more at – www.workplacepensions.gov.uk In a phased process over the next 3 years, every employer will have to enrol their eligible staff into a pension scheme by law. An intelligent and thought provoking post as ever by Capital Stewardship blogger Tom P here (and below) on the failure (I could be a little more direct) of the ESG (Environmental, Social, Governance) industry to promote Labour rights. 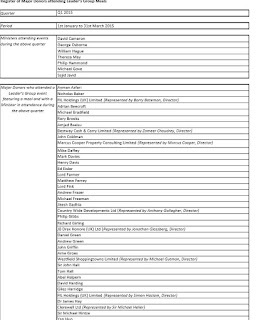 As someone who has an interest as the UNISON NEC member for the UK charitable and voluntary sector, I wonder how many of these organisations actually recognise trade unions for their own staff and have collective bargaining? Or realise if they don't - they are failing to follow the United Nations Global principles on human and Labour rights? By coincidence last week I attended a meeting of the Association of Member Nominated Trustees (AMNT) working group on their "Red Lines" initiative. Which is a new approach to pensions shareholder engagement and voting at Company AGMs. Labour rights and trade union recognition are accepted as key "Red Lines" - as important as environmental or corporate governance. (Tom P) "I've blogged a little previously about what I see as a general failure of labour issues to make it very high up the ESG agenda. As someone who has worked with and for trade unions in different ways for much of my adult life I find this frustrating, particularly as it contrasts sharply with progress on environmental issues in responsible investment. So I thought I'd go into a bit more detail. One of the things that troubles me is the apparent tolerance some people in responsible have for poor behaviour by companies on labour rights. I very much doubt this sort of behaviour would be tolerated in respect of other ESG issues. I think it is worth restating, as obvious as it should be, that labour rights are human rights. Therefore, where unions raise concerns about companies' not respecting labour rights this should not be seen as a "difference of opinion" between employer and employee, but a potential violation of human rights. Also, unions are very often able to provide specific breaches of labour law by companies. The consequences of such breaches vary considerably between jurisdictions but the key point is that companies are breaking the law, often repeatedly. Seen in these terms, I question why investors do not take alleged labour rights violations more seriously. Aside from the danger in being seen as tolerating abuses of human rights, I would argue that investors should see this as a serious hazard warning. If a company is breaking the rules over and over even if you don't personally like/support unions you should be concerned about whether this is indicative of a wider management attitude. However, for some reason this message doesn't seem to get through. I doubt a company that could be shown to have repeatedly violated environmental regulations would be given the benefit of the doubt by many ESG folks, but this does happen with labour rights. To take a real life example, imagine the reaction if a company stated that it would lobby aganst certain environmental standards because it was bad for business, and if it repeatedly used lawyers to frustrate attempts to make it more environmentally responsible. I think we know that most RI people would think this was intolerable. Yet this is exactly what happens when unions try to organise within companies. It is far more acceptable in the ESG world for a company to oppose unionisation, even when this strays into alleged breaches of the law, than it is for it to decline to adhere to voluntary environmental initiatives or targets. I have even seen an asset manager with some ESG credibility report publicly that it supports a company's right to campaign against unionisation because it thinks this is in the interests of the business. I genuinely get it that the working lives of retail workers, or dockers, or bus drivers are to most people in the the RI world a less interesting thing to look at than climate change, particularly if those workers live in developed countries and sound a bit thick. Engaging over these issues maybe doesn't have quite the same feeling that you are contributing to something important. But actually the ability of workers to bargain for a fair share is closely linked to inequality, surely quite an important societal issue. 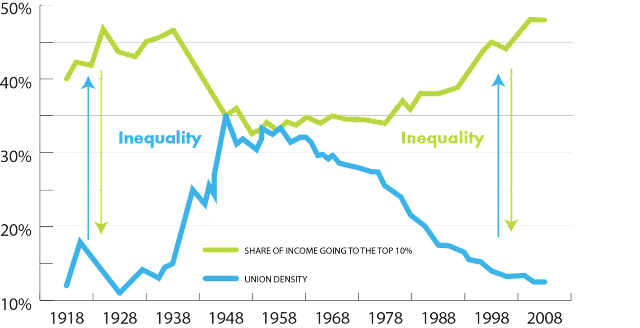 It's a bad news story really: the decline of trade union strength is closely correlated with increased inequality, as an IMF paper pointed out last year. The effects might be two-fold, weaker unions mean that labour is less able to bargain for a fair share, but also reduce the countervailing power that once held corporate management in check. 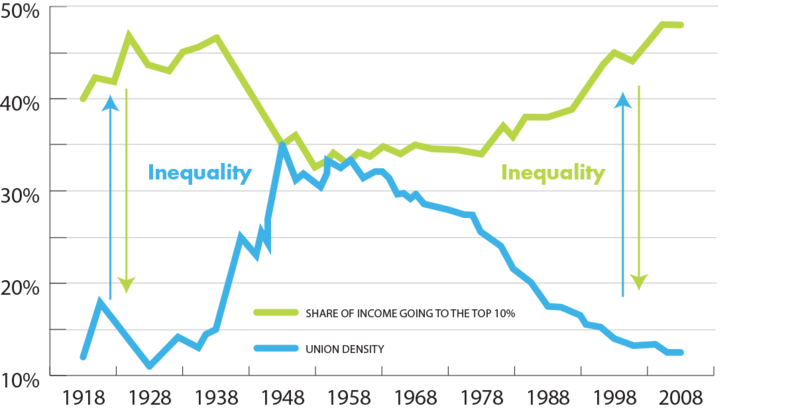 Is it any wonder that the US, with its weak labour law and numerous anti-union companies (and union-busting firms that advise them) is so unequal? So if you are concerned by inequality you should be concerned by companies that try to prevent or reverse unionisation. Finally, I think it's important to flag up the issue of beneficiary interest and representation. I genuinely believe that RI policies and practices should reflect beneficiary concerns where possible. There is a lack of good info on what beneficiaries really want to see in RI policies but some of the limited info we have suggests that they put more emphasis on basic employment-related issues than the ESG community as a whole does. If this is broadly correct this may be because they see a self-interest in it. We also know that beneficiaries want to get a decent return and are worried about getting ripped off. Therefore an RI policy that was generally rooted in beneficiaries' interests might have more to say about workplace terms and conditions on the one hand, and fees and charges on the other. To state the obvious we are long way from that, although this is broadly the territory that unions seek to occupy. I do worry a bit that the priorities expressed in responsible investment can sometimes look like the liberalism of the well off and successful. We're very good at flying around the world to conferences and signing up to global initiatives. In contrast, bus drivers complaining about shift patterns or faulty heaters can seem rather dull. If you've never done a menial job, or struggled to get on at work, you may well consider some of the complaints that union members raise to be trivial, or whiny. But these are the people whose money makes responsible investment possible. Without their pensions you and me don't have jobs. I think they have a right to expect that their voice gets a better hearing than it does currently". The collage is from Wednesday evening when Newham Trade Unionists were out leafleting in Stratford, commuters and shoppers about our NUAA launch event next Saturday 30 January, 2-4pm, main lecture theatre, University East London, Water Lane, E15 4LZ with Labour Shadow Chancellor, John McDonnell MP. Considering it was a bitterly cold night we had a good response. This is the invite from "Newham United Against Austerity" that has gone out to community groups and organisations in Newham. no doubt, like the Newham Trade Unions, you are concerned about the economic austerity programme of the current government. Flyers advertising the Public Meeting are enclosed in anticipating that your organisation will be able to send participants to that meeting and begin to work together with a view to bring to the attention of the people living and working in Newham, the implications of the ongoing decline in government financial support to Local Authorities and its negative impact on the services delivered by Newham Council. As you will see Newham Council are predicting that the Revenue Support Grant it receives from central government will be reduced from 60% of its income it received in 2013 to ZERO PERCENT in 2020. I leave you to imagine how Newham Council can employ sufficient Council employees to continue to deliver, even with prioritising the front line, its services to the level required by the people of Newham. I remind you that Newham is one of the most deprived local authorities in the country. On top of that with Inner London Needs it is still resourced as an Outer London Borough. We look forward to your support for and participation in building this important campaign. 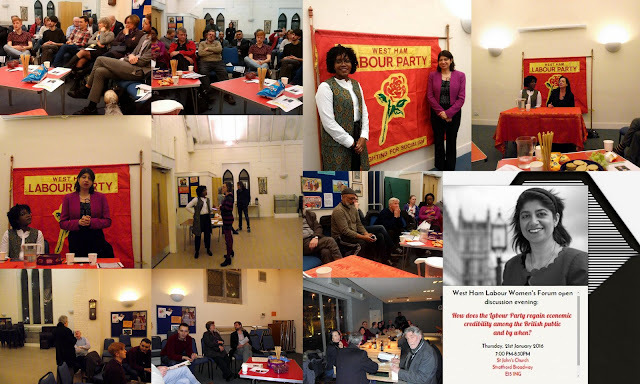 [NJTUC]: Formed in 1983 by Newham recognised Trade Unions: 1983 – 1987 ‘Fair Deal for Newham’ campaign against underfunding from rate-capping: 1992 -1997 “Newham Needs” campaign for Inner London Status for Newham then worth extra £48 Million to Newham.